Opal, October's birthstone, is recognized as one of the most precious gems in the world. Brilliance of color, pattern and the ability to change color in varying light all influence the value of an Opal. A chameleon of a thousand colors, Opal has the essence of every gem combined into one. 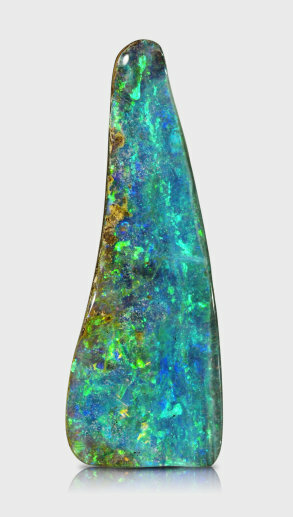 Called "The Rainbow Stone" by Australia's Aboriginal people, Opal is without doubt one of nature's most remarkable gems. Most Opal is more than 60 million years old. Opals are unique and no two are exactly alike. Opal is a "living" stone, which means it must be protected from heat and detergents that "dry" the gem. Care for your Opal jewelry by avoiding sharp blows to the stone and harsh chemicals. Clean using a mild soap. Do not use an ultrasonic cleaner. Prolonged exposure to water and or steam should be avoided. Opal comes in many sub categories like Boulder Opal, Opal Doublet, Black Opal, Fire Opal. The Gem Junkies have dedicated 2 whole podcast episodes to Opals and all its forms. You might also be interested by the still very popular and relevant article on Opal by our in house expert Frank Farnsworth from a presentation he did at the Tucson Gem Show.